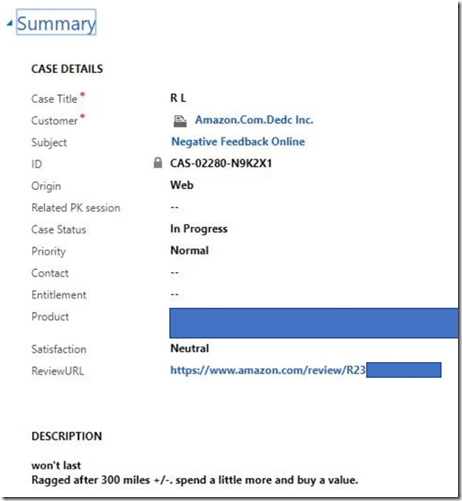 A few weeks ago I posted a blog on integrating PowerBI and Amazon to analyze Amazon product reviews. Now let’s take that a step further by using Microsoft Flow to integrate with Dynamics 365 to transform analytics into better ratings and customer experiences. Now that we had raised leadership awareness of Amazon reviews, we wanted to interact with them in some way. By demonstrating concern and a willingness to interact with unhappy consumers, we would reduce pre-purchase anxiety from potential buyers. The additional interaction also gave us a chance to remedy a negative review (however, consumers have proven they are unlikely to update a review even after a positive experience). I had already been working through a "Ticket Management Process" which would allow me to generate a ticket for each negative review, assign that to the appropriate person, and then record the completion of that ticket with a public response to the consumer. AMZShark has several facets and useful tools, but the first one I used with them was the Review Alerts to send emails to the Customer Service Manager whenever a list of items met with a review of three stars or lower. There are other tools out there, this was just the one I had chosen at the time…feel free to do your own research to decide if another better suits your needs. The largest technical issue with this process was that it relied on manual entry of the tickets based on emails sent to a single user. This meant if the user was ever out of the office, the entire process was delayed and reviews were left unanswered. And while the total time to enter tickets for the day never amounted to more than 30 minutes, it was an interruption that could be easily avoided. Microsoft Flow is part of the Office 365 suite and essentially acts as a cross-platform trigger and response cloud-based application. Simply put, it looks for an action in one application, and then can generate a responsive action in another application. Using Flow, I could automate the creation of these tickets based on when the alert emails came from the third-party service. The hurdle here is that the emails being sent have all of the pertinent information in a single field. This information would need to be separated out to be useful for our automation plans. From the image below, you can see how the typical emails are formatted. If they are all coming in from the same place, and all contain the same data in the same place, automating the process (or part of it) becomes more viable. With Parserr, I found a tool that would take the single field <Body> from the email, and turn that into <Title>, <Rating>, <Review URL>, <Description> (and <Item> will be added soon). 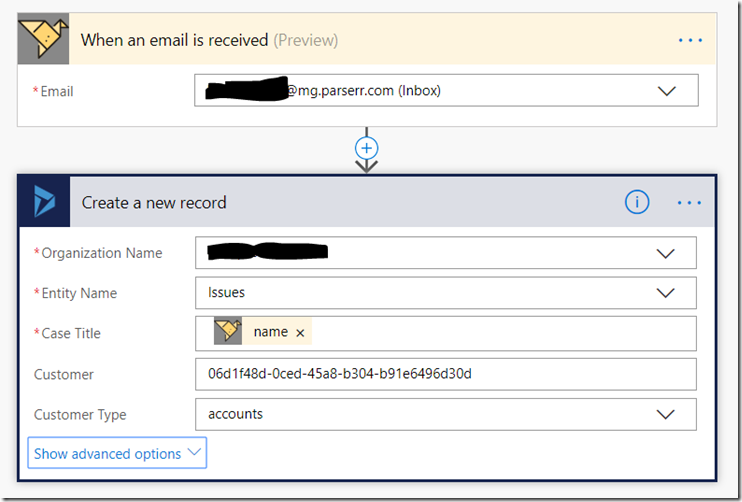 And then by using Flow, I was able to connect to both my Parserr account, and my Dynamics 365 instance, and create an Issue record whenever an email was sent to the Parserr inbox. Under the Advanced Options, I mapped the rest of the Parserr fields to the D365 record. You’ll notice that the Customer field requires the GUID, which is (in my opinion) a shortcoming on Flow’s side, but there are ways around that and I believe it is close to being resolved/more intuitive. By redirecting the AMZShark emails to the Parserr inbox, I was able to fully automate the creation of the support tickets. From there, the standard case resolution process can be followed to respond to low ratings – which includes: (1) responding to the customer, and (2) sharing the feedback with the operations group to identify and address chronic issues to improve products. There are so many templates and connectors inside Flow, you are certain to find one that is useful! Go experiment, make mistakes, learn and enjoy! If you’re looking for help with Flow, Dynamics 365, or with business process design, contact C5 Insight to talk to one of our consultants.